Although the Athenians escaped the yoke of the Persians, they later fell to the onslaughts of a long-time enemy closer to home—Sparta. In the centuries that followed, Athens was a subjugated city, ruled in turn by Macedonia, Rome, Byzantine emperors at Constantinople, Frankish dukes of the Crusades, and the Turks. When the Greeks gained their independence in 1829, Athens had declined to a small provincial town inhabited by only a few thousand people. Since 1834, when Athens became the capital of Greece, the city has grown at a rapid pace. It now covers some 170 square miles [450 sq km], spreading over the Attic plain. Its “fingers” thrust into the distance along the slopes of Mounts Parnes, Pendelikón, and Hymettus. The metropolis shelters more than four and a half million people—nearly 45 percent of the population of Greece. It was built largely without planning or regulation. By one estimate, more than a third of the housing went up illegally, and today just a small portion of Athens is not covered by concrete. Most of Athens’ modern neighborhoods are of the boxy, poured-concrete style of architecture. The city seems to squat in the sun, with an ancient column protruding here or there, dusted with gray fallout from industry and motor vehicles. Like many other modern metropolises, Athens suffers from smog. A smog cloud—called nefos by locals—forms a few feet above the forest of television antennas. The smog is eating away the ancient monuments so rapidly that archaeologists once considered erecting a glass bubble over the Acropolis. Pollution warnings are common. When weather conditions trap the smog inside the mountains surrounding Athens, nefos can be deadly to humans. On such days, private cars are banned from the city center, factories cut fuel consumption, the elderly are advised to stay indoors, and Athenians are asked to leave their cars at home. Athenians vacate the city en masse on weekends. “Jump into your car,” says Vassilis—a seasoned Athenian—as he enjoys a honey-sweet, nut-crusted baklava and a cup of bitter coffee at one of the cafés. “In just a few hours, you will be in the mountains or at the sea.” The implication of this remark is that you can hop into your car and then sit in bumper-to-bumper traffic for a couple of hours before the city gives way to the country. However, Athens says that it is serious about cleaning up, and it has a convincing record to prove it. For example, a large section of the city’s commercial center is closed to traffic. Before they were closed, these shopping streets were some of the most congested. Cars moved at an average of three miles [5 km] per hour, the pace of a leisurely stroll. Now trees in planters have replaced nose-to-tail traffic, and birdsongs have replaced the usual background sounds of grinding gears and whining motor scooters. The city has even challenged the traditional Mediterranean life-style, asking workers to stop heading home for a siesta—a habit that effectively added two more rush hours. The fact that Athens will host the 2004 Olympics has touched off a wave of unprecedented activity and development. Everywhere, machines are breaking ground to improve the infrastructure and to build roads and venues for the games. A new, ten-mile [18 km] extension to the metro system is almost complete. If all goes according to schedule, in March 2001 the first aircraft will land at the new international airport of Athens, an airport that has been dubbed the most modern in Europe. Moreover, by the year 2001, a total of 45 miles [72 km] of new freeways will be ready. These will divert traffic outside the center of Athens, and this will encourage the use of public transportation. It is hoped that this will reduce the number of cars in the city center by more than 250,000 per day and cut atmospheric pollution by 35 percent. The new biological treatment program for the wastewater of the greater Athens area promises to improve the maritime environment around the capital. The ambitious goal is, within a few years, to transform Athens into a new city, with an improved transportation system, more pockets of greenery, and a cleaner environment. 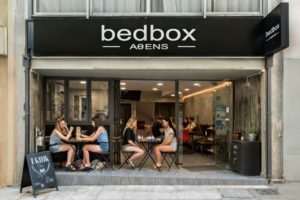 To many, despite new office towers, renovated boulevards and fountains, smart shops, and lively street life, Athens will always remain a village—spontaneous rather than disciplined, fragmented rather than ordered. The village side of Athens can be found in those parts of the city where houses still have tile roofs and balconies with iron grillwork and pots of geraniums. To find that Athens, I visit Plaka, the oldest neighborhood of the city, hugging the northern slopes of the Acropolis. There I find a warren of narrow and tilted winding streets, sagging houses, wine shops, stray cats and dogs, tavernas, and pushcarts. The area retains the raucous, carnival character of the past, which draws in the tourists. Tables that sometimes have one leg too short line the sidewalks, along with undersized chairs. The waiters, with menus held open, try to snag customers. The put-put of motorbikes drowns out the music of the organ-grinder. Whole rows of freshly tanned leather purses hang in front of souvenir shops. Armies of marble chessmen made in the images of Greek gods stand in battle formation, marionettes do folk dances, ceramic windmills turn. It is evident that this corner of the city fiercely resists any attempts at modernization. A visit to Athens would be seriously lacking without a sampling of the cultural wealth of the city. Tonight, I decide to attend a symphony with my wife at the restored Roman amphitheater of Herod, located on the south slope of the Acropolis. The pedestrian approach to the theater is a hushed, softly lit walkway under dark silhouettes of pines. The illuminated facade of ocher stones looms theatrically through the trees. We have bought upper-tier tickets, so we climb up the marble steps and then enter through a Roman portal into the amphitheater. We take a minute to savor the moment—a black velvet sky, a near-full moon behind a wisp of cirrus clouds, and floodlights, which turn the interior of the steep half cone into a brilliant scene. Hundreds of people—looking small and faraway in the vastness of this theater, which can seat 5,000—move along concentric rows of white marble to find their places. The stone seats are still warm from the sun, the same stones that have echoed drama and music and laughter and applause for millenniums. Also not to be missed are the numerous museums of the city. Most prominent among them is the National Archaeological Museum, with its impressive and thorough overview of Greek art through the centuries. Other museums worth visiting are the Museum of Cycladic Art and the Byzantine Museum. Since 1991 the Mégaron Athens Concert Hall—a majestic marble building with exceptional acoustics—has offered a year-round venue for opera, ballet, and classical music performances. And, of course, you can enjoy Greek folk music in many of the traditional tavernas. Modern Athens with its famous past faces the pressures of a challenging future. But its people have learned to adjust as best they can with good humor, ingenuity, and philotimo—literally, a love for self-respect. To most tourists, Athens remains a fascinating and culturally rich city.